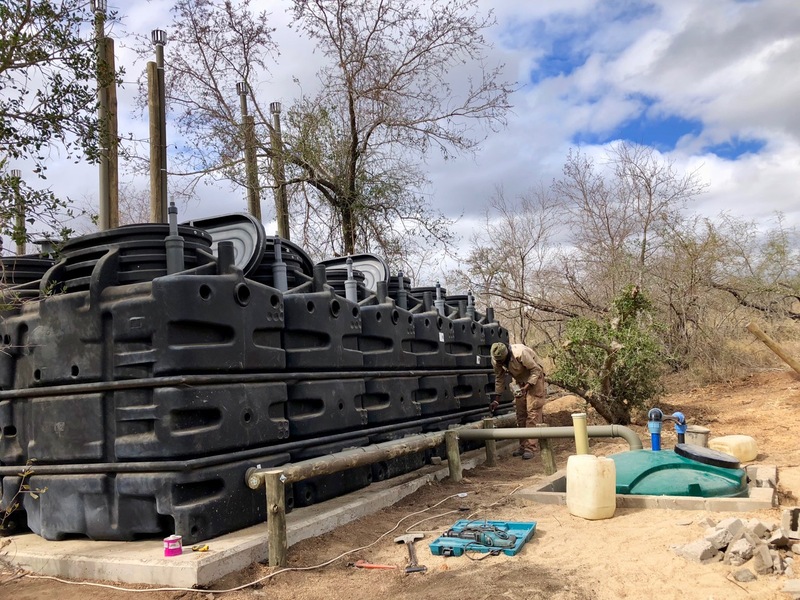 MULTIROCK installation at Sabi Sand Reserve, South Africa - BIOROCK S.à.r.l. The client is a luxury safari lodge operator with operations across the world. They are well known in Southern Africa for their prestigious lodges. This installation serves both their existing camp, as well as a new camp being constructed close by. The new camp will be ultra modern and luxurious, while the current camp is a more colonial and classic lodge. When complete, the system will cater for 154 people from both lodges. 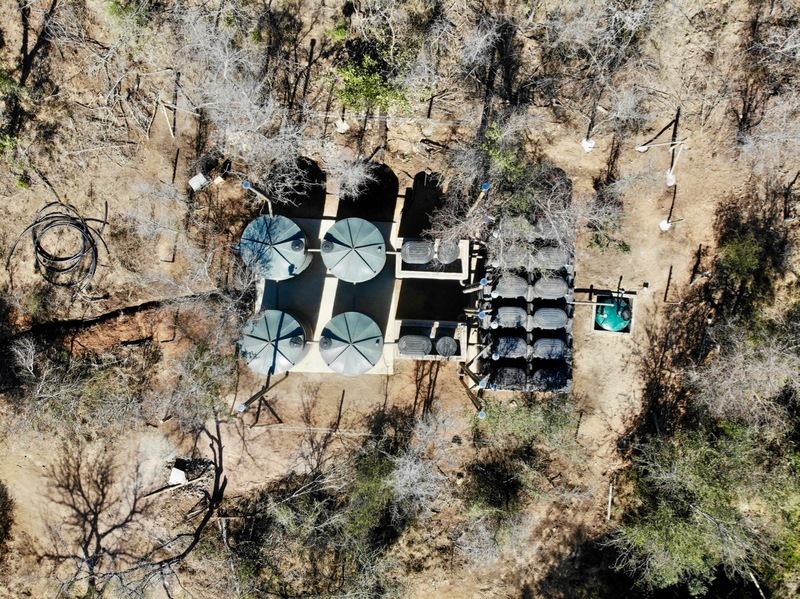 The sewage is collected in septic tanks at each of the guest suites, kitchen, laundry, and staff accommodations, and the supernatant from each septic tank is pumped to the plant. The plant is a Multirock-180, installed above-ground. The installation comprises two parallel treatment units each being a Multirock-90. 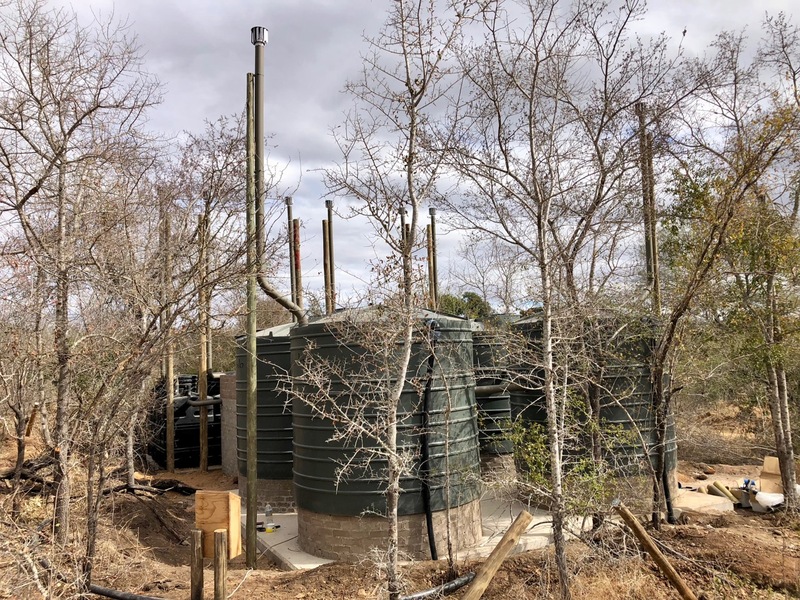 The pumped sewage from the septic tanks are received in (for each Multirock-90) 2 x 10,000lt above-ground primary tanks, followed by a FCC, SB and then 3x Ecorock-5000’s. The Primary tanks have effluent filters and are independently. The 6x Ecorock-5000’s were braced with a custom-manufactured bracing frame and the entire installation will be covered with a roof in due course. The outflow from the Ecorock’s are collected in a subsurface collection tank where it is chlorinated with chlorine tablets, and from there pumped back up to the lodge for irrigation of the lawns. The estimated water savings, by recycling and reusing their wastewater for irrigation, is some 10-million litres per year. The installation was completed and commissioned in July 2018.